Another significant characteristic of LTS releases is that they are built with a stronger emphasis on stability. Instead of loading in a pile of experimental new features, the developers focus on quality control and aim to make the software more reliable. Due to the extended support cycle and higher standard of robustness, LTS releases tend to be more appealing to business users and hardware makers. Although the focus on stability means that Lucid's roster of new features is shorter than usual, it still brings some impressive enhancements. One of the most noticeable changes is a completely new theme that radically departs from the distro's previous signature style. 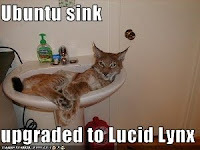 The fancy feline has shed Ubuntu's traditional brown coat and is sporting a sleek new look with an updated color palette. The new theme, called Ambience, has black trim, orange highlights, and an aubergine wallpaper. The visual redesign is part of a broader branding overhaul that will help to modernize Ubuntu's image. Ubuntu 10.04 introduces several usability improvements and heightened consistency thanks to ongoing efforts like the Ayatana project and the 100 Papercuts initiative. Ubuntu developers have transformed the panel notification area into a combined grouping of embedded menus, called application indicators, which have more consistent behavior and appearance. This will help reduce panel clutter and make long-running applications easier to manage. Previous panel simplification efforts, such as the messaging indicator menu that was added in Ubuntu 9.10, have received additional improvements in this release. Another major panel improvement in Lucid is social networking integration, which was introduced as part of Ubuntu's Social From The Start initiative. This feature is powered by Gwibber, my own open source microblogging client. I created Gwibber in 2007 and have spent much of my free time developing the application over the past few years. It's gratifying to see it become a part of the Ubuntu desktop stack. Gwibber isn't the only new application that was added in Ubuntu 10.04. Another very significant addition is PiTiVi, a video editing tool that is built on the GStreamer multimedia framework. PiTiVi is easy to use and won't intimidate inexperienced users. Canonical has continued its efforts to enhance Ubuntu One, a commercial cloud synchronization service that is integrated with the Ubuntu desktop. Some key additions in Lucid include preliminary support for mobile synchronization and a new music store that is integrated with Rythmbox. True to the LTS label, Lucid seems relatively robust. Although I didn't encounter any major problems with it myself during the beta cycle, there were a handful of major issues that got resolved at the last minute. The developers did a respin of the ISO after identifying a glitch in the boot menu configuration. Users who require ironclad stability should wait until remaining kinks have been ironed out before upgrading. Ubuntu 10.04 is available for download from the Ubuntu website. For additional details, you can refer to the official release notes. Keep an eye out for our comprehensive review. Anda sedang membaca artikel tentang Ubuntu 10.04 arrives with extended support (and less brown) dan anda bisa menemukan artikel Ubuntu 10.04 arrives with extended support (and less brown) ini dengan url http://www.nova13.com/2010/05/ubuntu-1004-arrives-with-extended.html, Anda boleh menyebar luaskannya atau mengcopy paste-nya jika artikel Ubuntu 10.04 arrives with extended support (and less brown) ini sangat bermanfaat bagi teman-teman Anda, namun jangan lupa untuk meletakkan link postingan Ubuntu 10.04 arrives with extended support (and less brown) sebagai sumbernya. waiting for date May 15, because I'll come to Lucid Release Party. @avanca: thanks.. oy, kan kaya clicker?? (penggemar ungu band). saya baru liat2 di sini... komplit banget..
@wans: thanks dah mampir dan mnyempatkan berkomentar..
Ubuntu 10.04 is very fast and useful software. very good sharing! 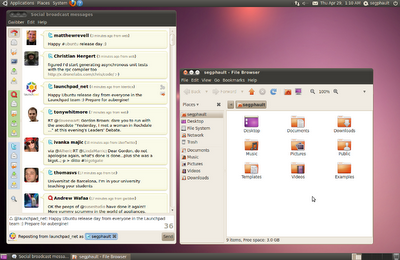 Ubuntu 10.04 is really awesome for new updated software. thanks for nice post.